Hike or ride along historic Buckhorn Ridge Bridle Trail, which runs through the heart of the Shawnee Wilderness Area, dividing the waters of Upper and Lower Twin Creeks. In the 1850s, William Flagg, a New York City businessman-turned novel writer, once sought refuge and enlightenment here, as he oversaw his stone quarry business. At the Point of Buckhorn Ridge, where Flagg built his log cottage, experience one of the region’s most dramatic Ohio River overlooks, with the formerly hustling river town of Buena Vista now resting almost silently below. Flagg, while visiting a sister in Cincinnati, had first fallen in love with the daughter of Nicholas Longworth, one of the Queen City’s most wealthy and powerful businessmen, and longstanding promoter of the wine making industry in the Ohio Valley. He then became enthralled with the world in the hollows and along the ridges of what is now the Shawnee Wilderness Area. Flagg would plant vineyards and orchards on his lands on Lower Twin Creek, where he also built a stone cellar for storing his wine. Flagg spent extended periods of time here in the 1850s and 1860s, until the cabin burned in an unexplained fire. 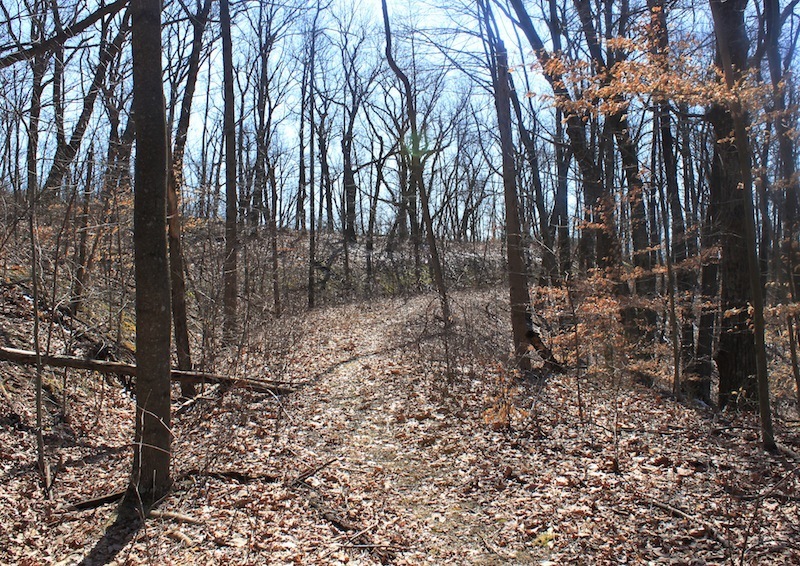 In the 1930s, the Civilian Conservation Corps built a road to the Point of Buckhorn Ridge and this road serves as a testament to the quality work done by the CC Boys. After its closure in 1972, once the area became protected as a Wilderness, the road has only been minimally maintained as a horseback bridle trail. Buckhorn Ridge Bridle Trail, Shawnee Wilderness Area, Scioto County, Ohio (2012). : Image courtesy of Andrew Lee Feight, Ph.D., from the Scioto Historical Series, private collection, Friendship, Ohio. Andrew Feight, Ph.D., “Buckhorn Ridge & William Flagg,” Scioto Historical, accessed April 24, 2019, https://sciotohistorical.org/items/show/5.